With his weekly radio show, Juergen Boernig is a familiar voice to many Eurovision fans. But we wanted to know more about the man behind the microphone, so ESC Insight asked him to feature in this week's "Meet the Fans" interview. Kicking off a new feature, we meet fans from around the world to ask about their motivations, their love and their greatest moments of Eurovision. 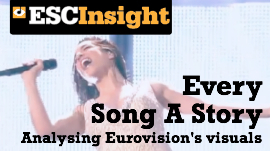 Today, we ask Liam Clark, of ESC Daily, how and why he has become a fan of the Song Contest, and how he has become further entangled in the world of Eurovision.